Shure SM58 vs. Sennheiser e845 – Live Mic Showdown! Have you ever been to a gig and used one of these popular live microphones? Are you thinking of adding one of these to your arsenal but you’re undecided on which one is the best fit for you? This detailed buyer’s guide will help you choose which of these two trusted live mics, the Shure SM58 or the Sennheiser e845, is best for your needs. 1 Shure SM58 vs Sennheiser e845: Let's Find the Winner! Shure SM58 vs Sennheiser e845: Let's Find the Winner! I’ve personally sung many shows on a Shure SM58, and as a live sound engineer I’ve depended on this microphone at countless gigs, including everything from stand up comedy, to rock n’ roll, to school events. But how does the Shure stack up with regards to sound quality? With a frequency response of 50Hz-15kHz and a sensitivity of -54.5dBV/P, it’ll get the job done at your gig. When working with an SM58 on a mixing board, I often find myself taking some time to take out some lows and dial in some highs. On the other hand, It can get a bit heavy in the low-mid frequencies, it can sometimes wash out the clarity of words coming from a vocalist, especially when it has some reverb going through the signal chain. In my experience, the SM58 has been more about durability and dependability than clarity. If you’re playing a gig at a venue that isn’t optimized for perfect sound, though, I find that the Shure SM58 gets the job done and it sounds good doing it. 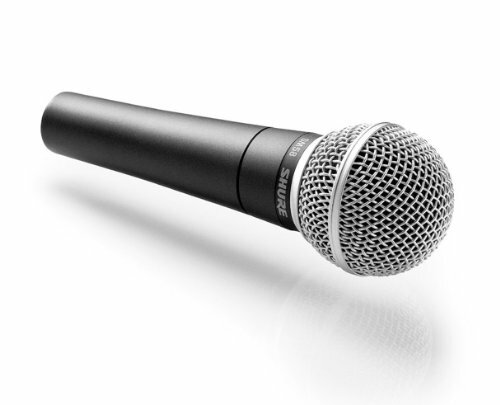 The warm wash of the Shure SM58 isn’t as noticeable when you’re singing at a venue with a wooden or concrete floor. With the Sennheiser e845 you get a boost in sound quality performance with a similar ruggedness to the road warrior SM58. I used an e845 in the studio recording electric guitar from an amp head and it sounded brilliant! I’ve used this microphone for everything from voice acting, to singing, to recording saxophone, to mixing live female vocals and I love the added presence that the e845 brings compared to the SM58. It’s not just my ears, because the e845 out-performs the SM58 in its stats, too. It has a frequency response of 40Hz-16kHz and a sensitivity of 1.8mV/Pa which are both superior to the SM58. You can hear it, too. Especially in your Ps and Bs. 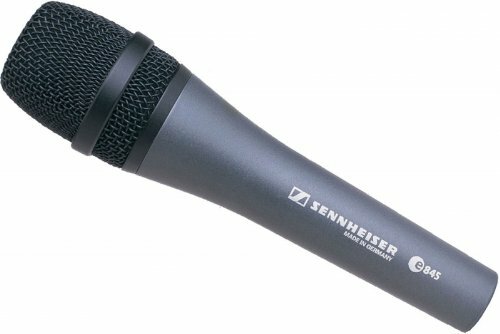 The Sennheiser contends with condensers when it comes to vocal sound quality, but it still controls like a dynamic. The Shure has a nice, warm sound, but it’s not nearly as impressive. When it comes to sound quality, I’d say it’s a clear advantage for the Sennheiser e845. Are you a rockstar who needs a microphone that can stand up to the abuse of live gigging? Let’s see just how tough the Shure SM58 and Sennheiser e845 are. When I think of both of these microphones, I think of dependability. They’re both rugged workhorses that are trusted staples in sound production, especially when it comes to live sound. When I’m playing a gig at a rugged bar, I always take my SM58. If something spills on it, if I spit all over it while singing, if somebody drops it during tear down, I know that it’ll be fine for the next gig. The Shure SM58 is so famous for its durability that it has even inspired countless durability test videos. People have run over their SM58 with a truck, put it in a glass of water, and dropped it off of a three story building only to plug it in and use it minutes later. Its reputation precedes it: it’s the toughest microphone in the biz. Its dependability is second to none. I played my first gig while I was in high school and I sang on an SM58. I’ll probably sing on an SM58 until the day I die. It’s got a warm tone that I’ve come to know and love over the years. The Shure SM58 is slightly shorter (162mm) than the Sennheiser e845 (185mm), but on the other hand the SM58 has a wider diameter (51mm) than the e845 (46mm). Warranty: If you choose to buy either of these microphones new, you will get the same 2 year warranty for parts and labor. While I haven’t had a problem with either mic’s durability, I have treated my Sennheiser e845 more kindly over the years compared to my SM58. Based on its reputation and based on my experiences abusing dozens of SM58 mics over the years, I give a slight edge to the SM58 in the durability category. You know the story: hard rock singers know all too well about singing in a bar and putting their mouth right on an SM58. The Shure SM58 uses a Cardioid polar pattern, and because of this it’s easy to find the “sweet spot” of the microphone… it’s practically a straight line to the center of the grill! On the other hand, the Sennheiser e845 uses a Supercardioid polar pattern. Simply put, instead of only being able to sing directly into the grill, as is the case with the SM58, the e845 can pick up your voice with a bit more leeway on either side of the grill. Ask yourself: why do I want this microphone? I found the Sennheiser e845 to be as useful in the studio as it is at a gig. It can record anything from acoustic guitar to amplifiers, saxophones to cymbals, all with a clarity that rivals my condensers. When recording instruments, vocals, or even voice acting, it picks up more detail than the SM58. A lot of these details come from the mic’s Supercardioid polar pattern. Meanwhile, if you just want a no-fuss live mic, a Shure SM58 will get the job done, every time. I’ve compared the prices of these microphones on various online sites and I’ve seen a difference of roughly $20 (€15) between the two. 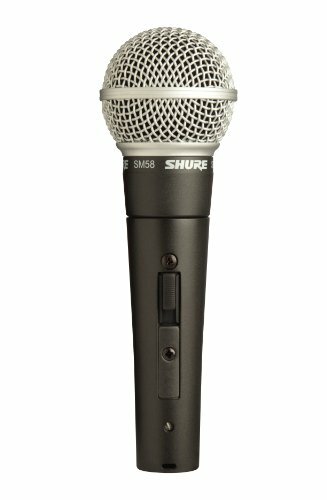 The Shure SM58 is the slightly less expensive option and will only cost you a little more for an on-off switch. They’re both good mics. They’re both trusted for a reason. I’ve owned and used both of these mics for years before I was ever a gear reviewer. When it comes to value, you need to ask yourself why you’re making the purchase. If you’re ordering multiple microphones and you need to order them on a budget, you can’t go wrong with a few Shure SM58s. What’s more, you’re a no-frills vocalist looking for something stable, go with the mic that’s been trusted for decades: go with the SM58. But if you’re looking for a more sensitive, versatile mic: treat yourself! Think about it, at only $20 or so more, you’re getting a lot more bang for your buck with the Sennheiser e845. 5 years ago I tried the Sennheiser e845 and I’ve come to the conclusion that it’s just a higher quality, more versatile microphone… and for a similar price! It’s as useful in the studio as it is at a live gig. It’s more sensitive to treble and bass frequencies, and with its Supercardioid design it picks up every little consonant that my teeth pronounce. If this is your first vocal mic and you’ve got the extra 20 bucks to spare, I recommend the Sennheiser e845. But I always keep a Shure SM58 in my guitar bag as a backup. It’s such a rugged mic that, if nothing else, it works as an insurance policy. First, ask yourself why you want to buy a dynamic mic. Hopefully, this buyer’s guide and detailed comparison of the Shure SM58 and Sennheiser e845 helps to make your shopping process a little easier.